EXCITING ANNOUNCEMENT: KITTY CITY IS NOW OPEN FOR BUSINESS! We’ve got some exciting news to share! 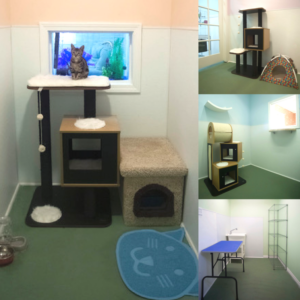 Due to popular demand, we are now offering cat boarding at our new expansion, Kitty City! Located right next door to Dogville Daycare, you can now board your dogs and cats at the same address, but with the assurance that each are cared for in their own unique way. No dogs are allowed in Kitty City, so your cat can feel safe and secure during their stay. Cats and their owners have their own private entrance and exit to the boarding facility. Our cat boarding is cage-free, with spacious suites, climbing furniture and in-room entertainment! Want to know more? Check out our webpage at WWW.KITTYCITYTULSA.COM or call us at 918-949-6070, press 1 for dog an cat boarding! Please share with all of your cat owning friends!